Fundraiser for Black Gold Kai Club. Tickets available from: Balclutha Information Centre Johnstone Electrical. 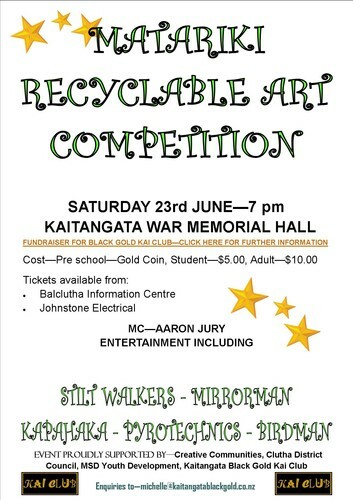 Art competition with sections for adults and children. Entries will be modeled and judged on the night, great prizes and fantastic atmosphere. Entry information available at the website. Entertainment by Highly Flammable - Mirrorman, stilt walkers. Pyrotechnics and a kapa haka show. Tickets available from Balclutha I-site and Johnstones Electrical.